If your audience includes those hard of hearing, this assisted listening system rental will boost the audio for those participants. Rent this assisted listening device system if your meeting will include participants that are hard of hearing, or if you are in an environment with high ambient noise. 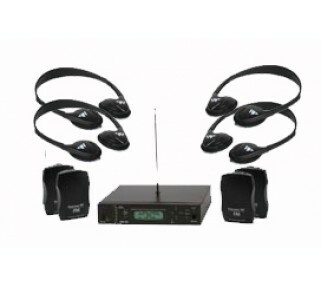 This system will connect into your existing microphone and speaker system, and transmit the presenter's voice wirelessly to a pocket-sized receiver that hard of hearing participants can wear on their belt or keep on a table. That receiver has headphones that the participant wears to hear the presenter at whatever audio level is comfortable for them. Call us to discuss your assisted listening device needs, and we can advise you on the best configuration for your meeting. Additional sound system components (such as microphones and a mixer) are required. Please note that this is a delivery only item. Additional receivers/headphone devices can be ordered.